Kees Kodde is the trade policy campaigner at Greenpeace. 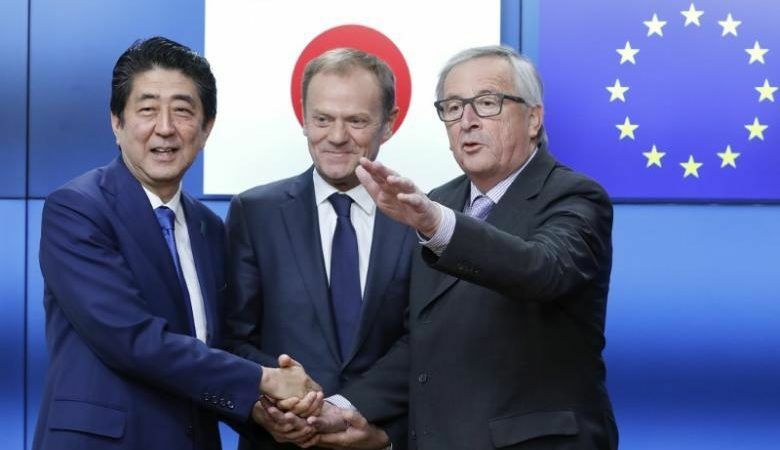 Japanese Prime Minister Shinzo Abe and EU leaders are eager to conclude a trade deal at a summit in Brussels on Thursday (6 July). The agreement is the latest example of an EU trade policy that only pays lip service to social and environmental protection. Non-governmental organisations and trade unions have joined millions of people around the world in opposing dangerous trade deals that put corporate privilege ahead of the public interest. Over three million EU citizens have objected to similar deals with the US and with Canada (known as TTIP and CETA, respectively). And more than 2,300 city and local authorities in Europe have declared ‘TTIP-free zones’. Proponents of uncontrolled trade are keen to depict opposition to these trade deals as a protectionist menace undermining the very foundation of liberal democracy. But protesters are not calling for the EU and other blocs to shut themselves off from the world. They are in fact standing up for democracy, the rule of law, transparency and a trade system where corporations do not have special rights and exclusive access to special courts. They are challenging politicians to use trade negotiations to help address some of the most pressing challenges we face: climate change, biodiversity loss, resource depletion, inequality, poverty and armed conflict. Unfortunately, the recent leak of the EU-Japan trade deal by Greenpeace Netherlands shows that a participatory and people-focused approach does not come naturally to the European Commission and EU governments. Instead of taking advantage of the EU’s powerful economic position, the Commission has yet again pursued a trade deal that benefits global corporations, at the expense of people and the planet. The EU’s lax attitude to illegal logging is but one of many concerns. Japan is the world’s fourth largest importer of wood products and illegal timber can easily enter the country because of weak regulation. Yet, the deal’s provisions on illegal logging are even weaker than those Japan agreed to in the now defunct Trans-Pacific Partnership agreement. Although the Commission has pledged to uphold the highest standards in EU trade agreements like this one, CETA and TTIP, it has in fact protected the interests of global corporations at the expense of the environment, public health and social rights. With the EU in the midst of a major soul-searching exercise and European-wide elections less than two years away, it’s time for European leaders to hit the reboot button on trade policy. The future of Europe will be bleak unless the political establishment in Brussels and in European capitals responds to the concerns and wishes of citizens. A new kind of trade policy would help improve the perception of the EU among Europeans. It would help bring communities together and make the world a more peaceful, open and connected place. To achieve this, trade must not be an end in itself, but a means to achieve social and environmental justice. Until then, and until there is full transparency on trade policy, Greenpeace and others will continue to shine a light on trade agreements that exploit people and the environment. DECADES of LITIGATION AHEAD for WANNA-BE MILLIONAIRE TPP, et al, INVESTORS as Financially Ruinous & Unapproved Morphing of Treaty/’Arrangements’ Punish Taxpaying Voters; The Global Corporate Assocs. will get it ‘Even More Right’ after Dark (without Scrutiny)? The ‘harmless’ Canadian NON-shareholders, et al, both; Native & non Native’. SUING the GLOBAL CORPORATE ECONOMY; GETTING TPP, et al, nations to PAY The COMPENSATION; WHO KNEW WHAT & WHEN? & its Gov’t. Encourages Corporations to Punitively Punish the ‘harmless’ Citizens via Secret Tribunals? BETTER CHANCE of INVESTORS GETTING PAID & the ‘harmless’ CITIZENS REMAINING NON-LIABLE IF U.S. & CANADA OUT of GLOBAL TREATIES?